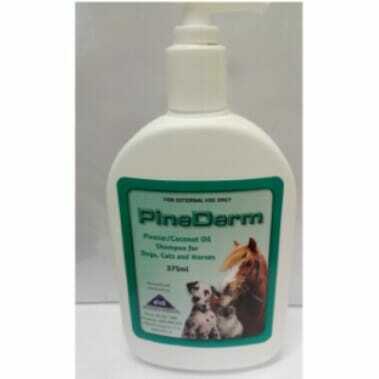 Pinederm shampoo is a soap alternative shampoo specifically formulated for use as a supplement to the medical treatment of pets with chronic dermatosis where pruritis is a feature (e.g. flea allergy dermatosis, atopy, seborrhoea). Pinetar – 2%. Incorporated for its known antipruritic properties. Triethanolamine Lauryl Sulphate – a detergent and wetting agent with some bacteriostatic activity. Coconut diethanolamide – a detergent with a coconut oil base. Fluorescein – a water soluble dye. Pinetar reduces pruritis and scaling. Cocnut diethanolamide helps replace oils lost from the skin during bathing. Triethanolamine Lauryl sulphate assists the removal of accumulated dirt. Fluorescein acts as a water soluble dye marker to ensure that all the shampoo is removed from the coat by thorough rinsing. Directions for use: Shake the bottle well, wet the animal, apply shampoo and lather well, leave for 10 minutes, wash off throughly. Correct application is essential fro good results. Pinederm is not to be used as an ointment or lotion.